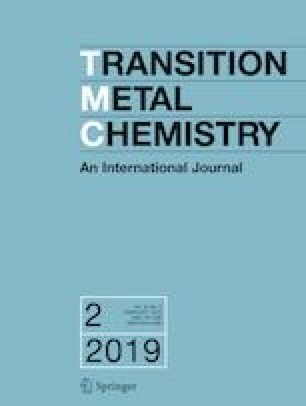 In this work, the synthesis and characterization of seven complexes (1–7) was performed with Zn(II), Cu(II), Co(II) and Ni(II) transition metals and ligands derived from bis(3,5-dimethylpyrazol-1-yl)methane (bdmpzm) and bis(3,5-dimethyl-4-nitro-1H-pyrazolyl)methane (L). The complexes were obtained in high yields, isolated as air-stable solids and characterized by physicochemical and spectroscopic methods. The structures of L and complex 1 were determined by single-crystal X-ray diffraction analysis. The complexes and their respective ligands were evaluated against epimastigotes of Trypanosoma cruzi strains. An increase in the activity of the complexes was observed compared to the free ligands. Greater activities were found for Co(II) complexes than for Cu(II), Ni(II) and Zn(II) complexes. Additionally, complexes 3 and 9 had little effect on erythrocytes, indicating that they are non-toxic. The results obtained in mitochondrial membrane potential analyses suggest a possible mechanism by which complex 3 has a trypanocidal effect through the induction of oxidative stress. 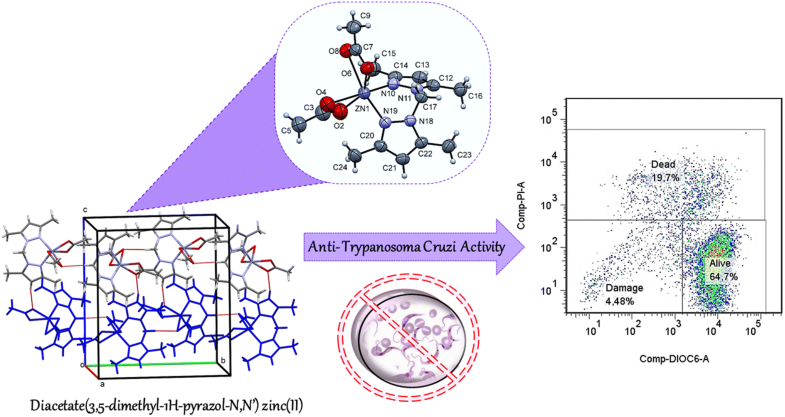 The results could provide an interesting contribution to the further design of active complexes against T. cruzi. Synthesis and structural characterization of new complexes with zinc(II), copper(II), cobalt(II) and nickel(II) transition metals derived from bis(pyrazol-1-yl)methane ligands. The cobalt(II) complexes have high activity against epimastigotes from Trypanosoma cruzi strains and are not toxic. The online version of this article ( https://doi.org/10.1007/s11243-018-0277-6) contains supplementary material, which is available to authorized users. Thanks to the Department of Chemistry and the School of Science of the Universidad de los Andes for financial support. O. Triana acknowledges the Universidad de Antioquia, Estrategia de sostenibilidad UdeA. We thank the reviewers and editor for their useful comments. CCDC 1586067 and 1586068 contain supplementary crystallographic data for L and 1, respectively. These data can be obtained free of charge via http://www.ccdc.cam.ac.uk/conts/retrieving.html or the Cambridge Crystallographic Data Centre, 12 Union Road, Cambridge CB2 1EZ, UK; fax: (+44) 1223-336-033; or e-mail: deposit@ccdc.cam.ac.uk.